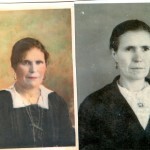 My mother “Carmelina” was a great cook who showed her love for her family through her cooking. 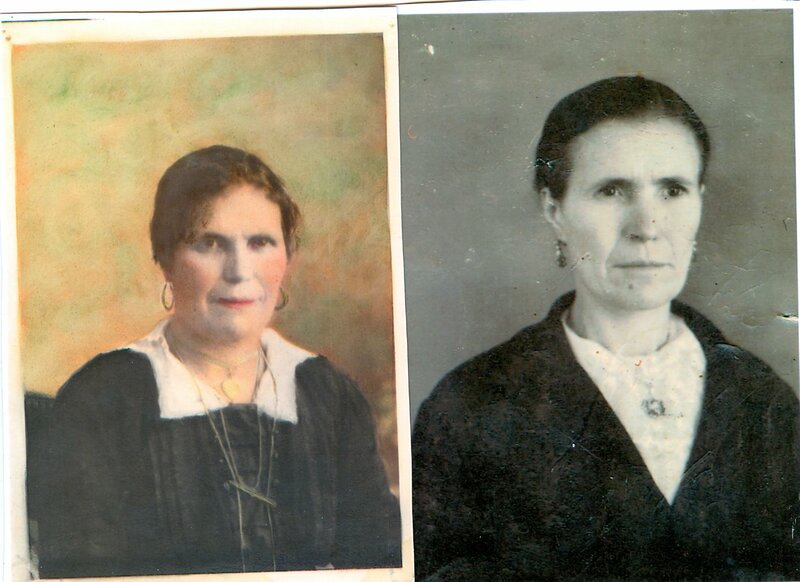 The Classic “Folar de Chaves” was her specialty. 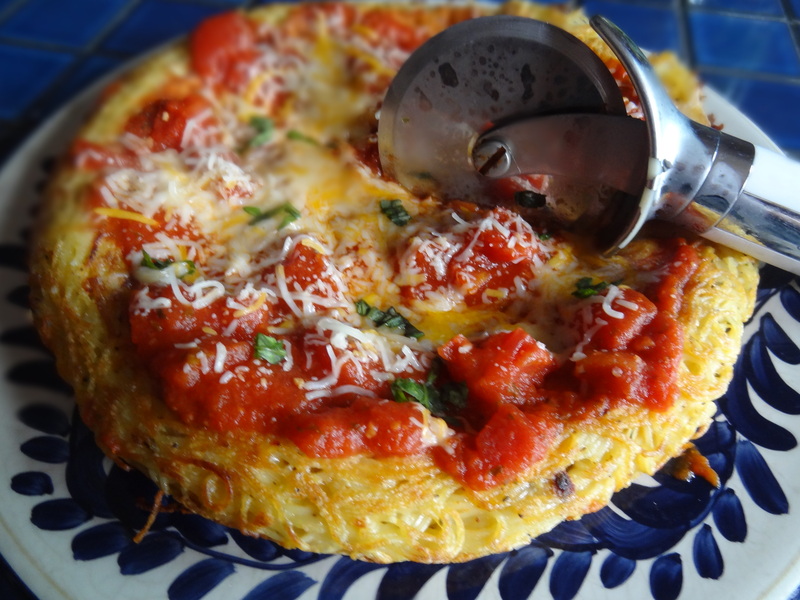 Every year during Easter many of her friends would come to our house to learn her recipe, but it seemed that no one was able to replicate it’s texture and goodness. I think the secret was in her method of kneading the dough which left it very airy, along with the prayer she said as she formed a cross on dough before rising. 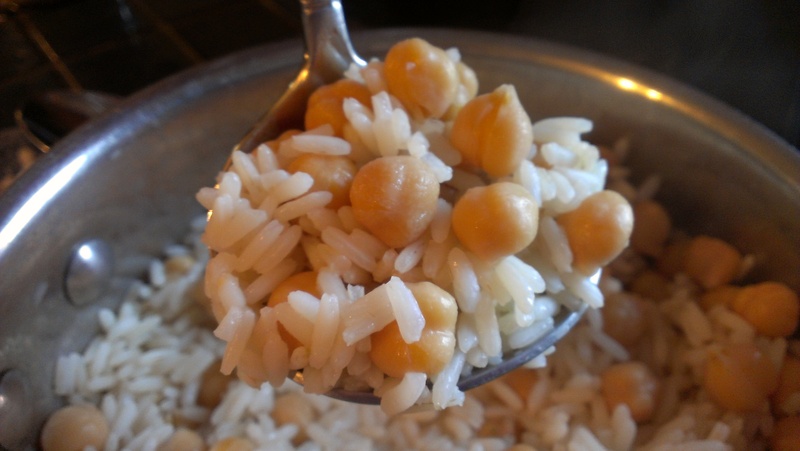 I’m going to share her recipe with you, not only in her honor, but to also celebrate the 50th anniversary of my family immigrating to America. We arrived at JFK at 9pm on that cold day in March, but I don’t remember anything about the trip. My first memory of my life in America was waking up out of bed, placing my young bare feet on a cold linoleum floor and wondering, where am I? 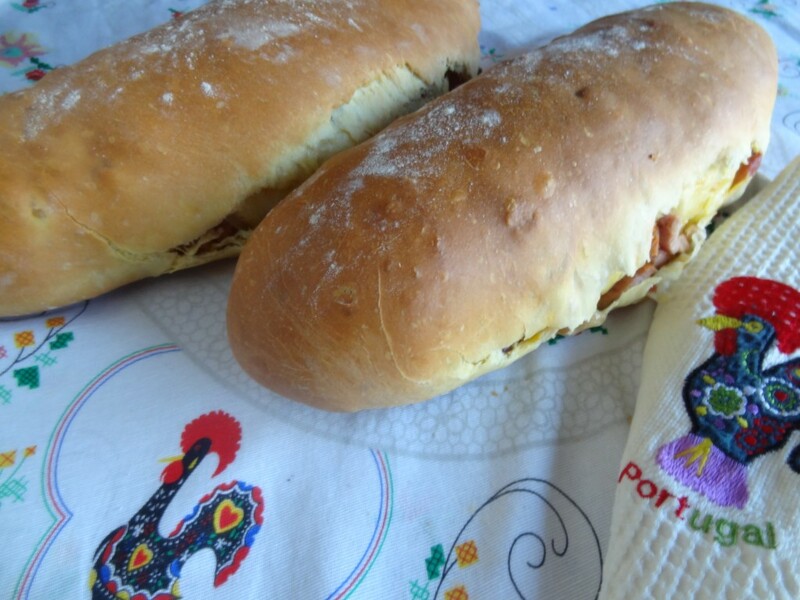 Folar is a Portuguese bread that has a long tradition in the culture of Portuguese cuisine. 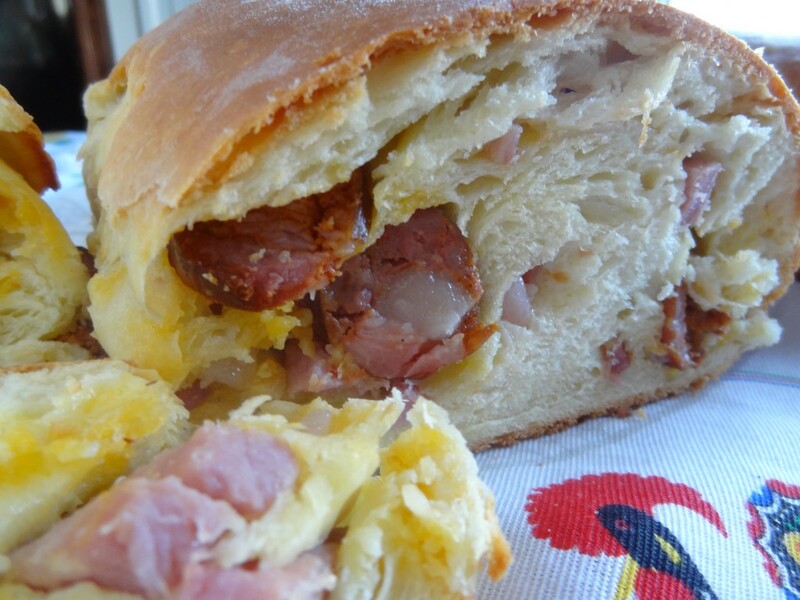 Although it is customary to serve the bread at Easter, it is eaten year round at celebrations and many Holidays as well. 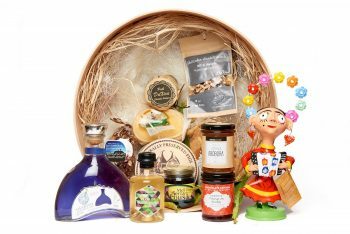 Folar de Chaves, originated in the north-eastern Portuguese regions of Chaves. 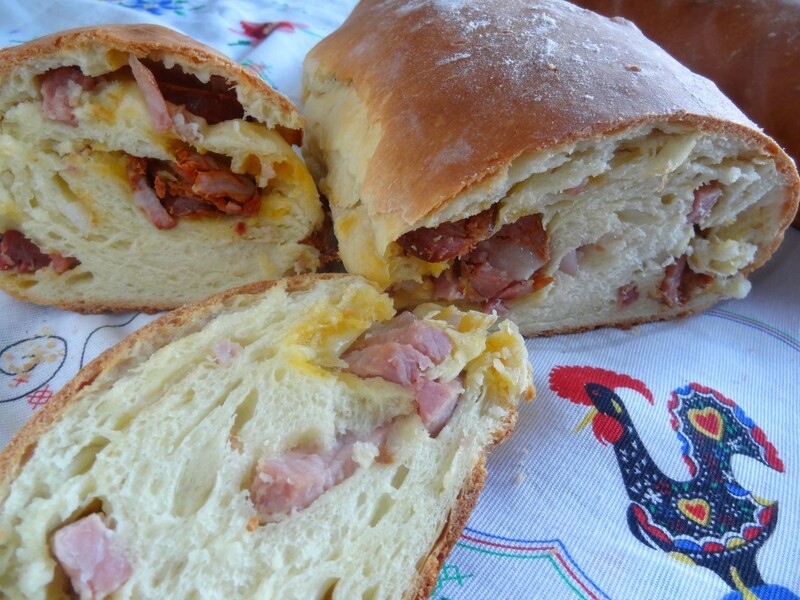 Generally the egg rich bread is stuffed with various cured meats such as; ham, presunto, cured bacon, salpicao and chourica but there are many variations and every family has it’s own different recipes. The are also sweet folars like the Folar de Pascoa which is sometimes cooked with hard boiled eggs at Easter to symbolize rebirth and fertility. “The folar was born of love. In a Portuguese village, a young woman named Mariana dreamed of marriage. She prayed unceasingly for the Santa Catarina to arrange an early suitor. The Saint answered her prayers and sent her a wealthy nobleman and a poor farmer. Mariana did not know which one to choose and returned to Santa Catarina asking her help to choose the best suitor. One day, young Amaro, the farmer, knocks at the door asking for a response to his proposal by Palm Sunday (the Sunday immediately before Easter). 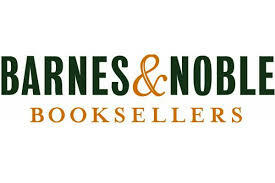 The rich nobleman also proposed, and asked for a decision also on the same day. Palm Sunday arrived. A very upset neighbor ran to Mariana’s house to warn that the gentleman farmer and the nobleman had met on the way to her house and thus engaged in a death struggle. Mariana went to them and prayed for help from Santa Catarina. Mariana, called out “Amaro” the name of the poor farmer. After the fight, it was rumored that the Nobleman vowed to appear on the couples wedding day to kill Amaro. On the eve of Easter Sunday, Mariana was tormented with the possibility and decided to rely on prayer. She placed a bouquet of flowers at the statue of Santa Catarina. Upon returning home, Marina was surprised to see the same bouquet on the table, next to a cake made with whole eggs. Amaro ran to Marina’s house and met her on the road to her house. He told her, that he too, had received the same cake surrounded by flowers. Thinking it was an action by a nobleman, they went to his house to discover the same scene with the cake and flowers had occured. Originally called “folore ‘, the cake came, in time, to be known as folklore and became a tradition that celebrates friendship and reconciliation. Easter Surprise! Here’s the recipe from my cookbook! 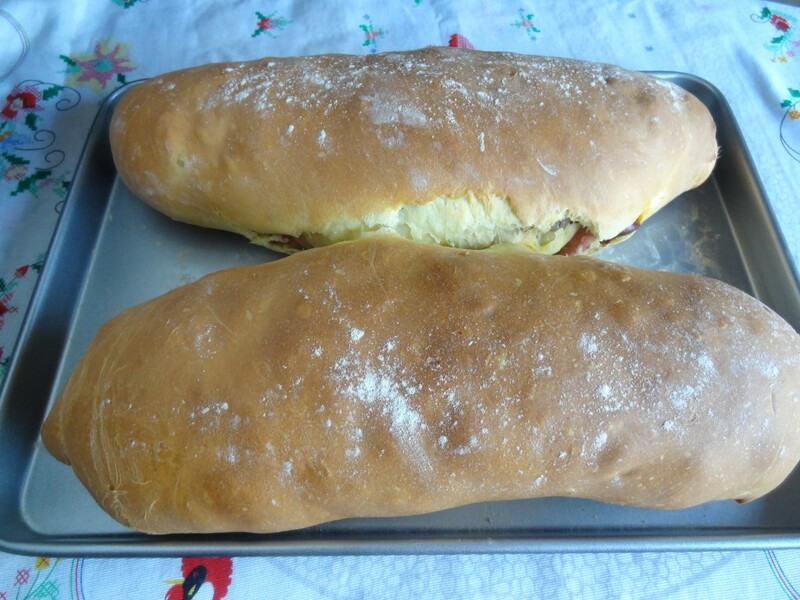 Ingredients: This recipe makes 4 small loaves or 2 medium loaves. 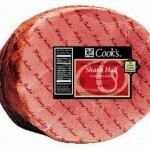 *Note: I use this: “Cooks” Low salt ham. 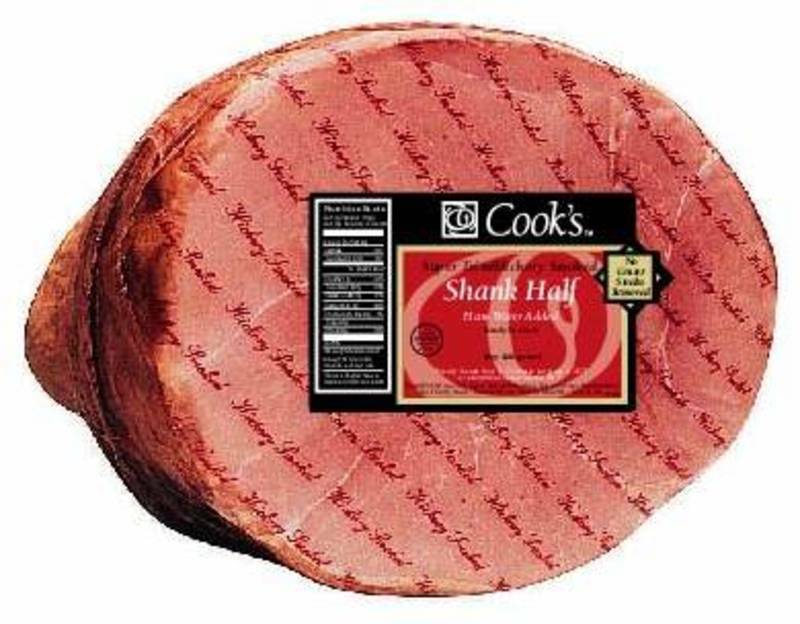 It has less fat and salt but every family has their favorite meat choices. I do not add Bacon since I prefer a less smoky taste to the folar. Some recipes add Presunto, Bacon or Salpicao. In a small pan on low heat add water, margarine and olive oil. When margarine is melted, test with your finger. 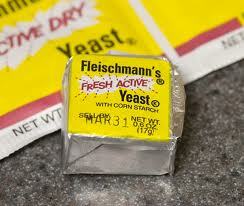 It should be warm, not hot or you will kill the yeast. 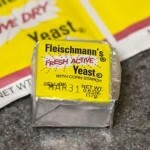 Add the yeast and stir to dissolve. Set aside. Sift Flour and salt into a very large mixing bowl. 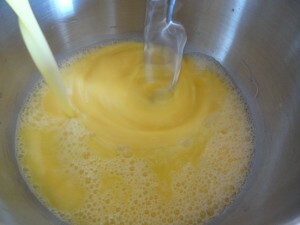 Make a well in the center of the flour and add the eggs and the yeast mixture. The batter will be thin and very elastic, not thick like bread dough. 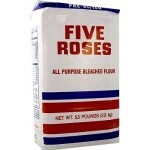 If you find it too thin add flour 2 tablespoons at a time and mix well. 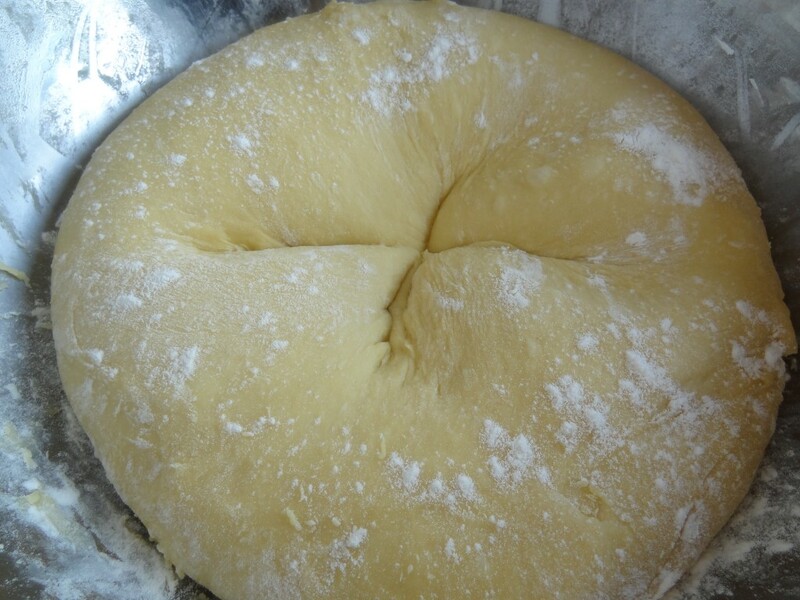 Grease your hands with olive oil and shape the dough into a ball on floured surface. 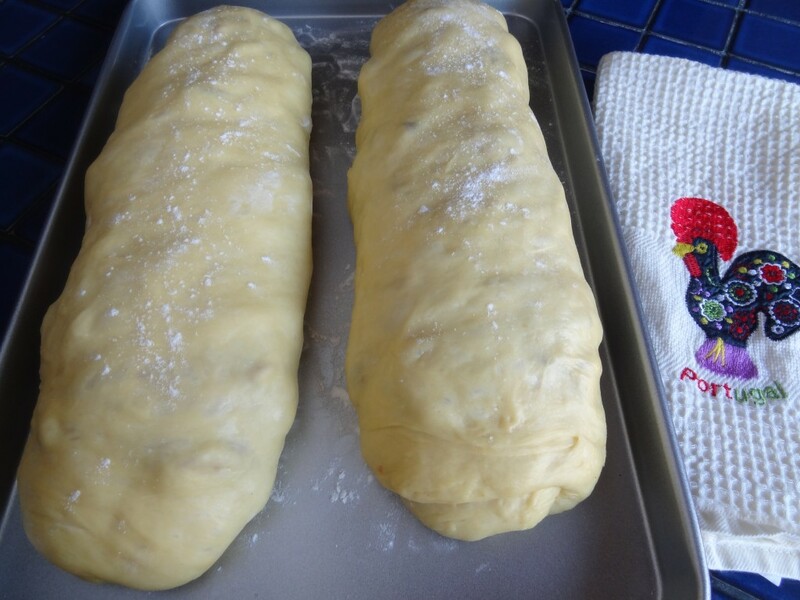 Place the dough in a larger bowl that has been greased with olive oil and dusted with flour. Make a cross in center of the dough to “Bless” the dough and sprinkle the top with flour. Cover with plastic and let it rest for 2 hours or until it has doubled in size. Your dough will be light, airy and elastic. Note: This step is optional depending on your taste. 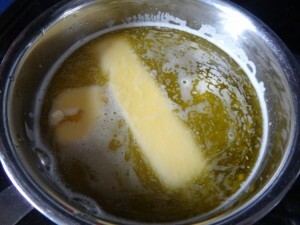 I place the meats into a pot of boiling water and let them cook for about 2-3 minutes to remove the salt and fat. Drain the meats, pat them dry and let them cool. When dough has risen, lightly grease and flour your hands to handle the dough. Poor it onto lightly olive oil greased and floured surface big enough to hold the dough. Note: I cover my counter with saran wrap for easy cleanup. The dough is very tender. 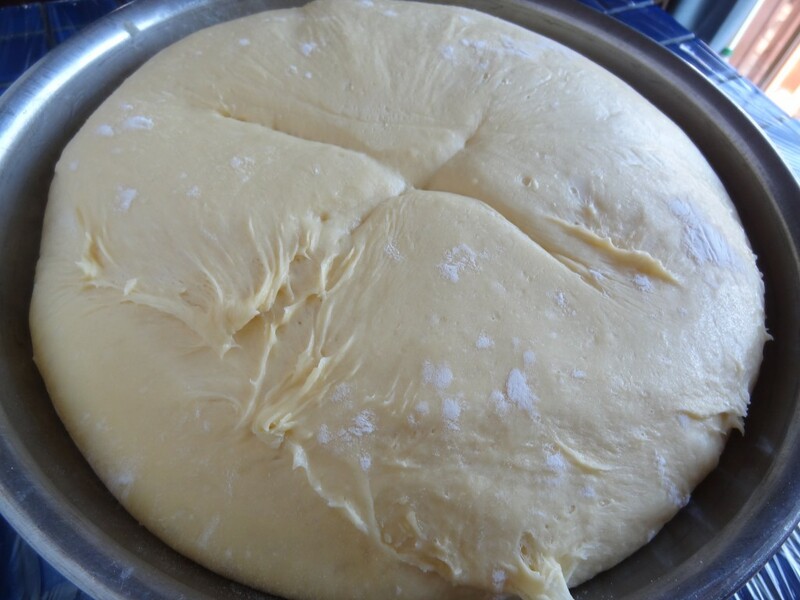 Gently stretch the dough into a desired rectangle shape almost like making a pizza, being careful not to tear it. 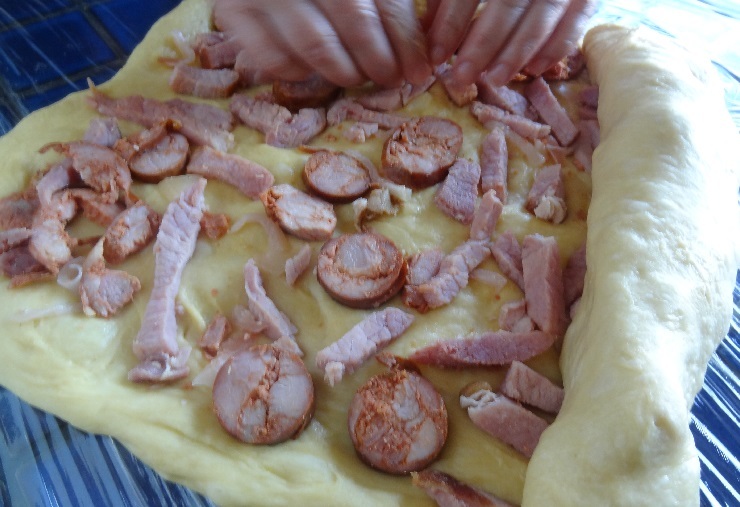 Spread the meats evenly over the dough and gently roll the dough into a loaf. If any holes form, close them up by pinching the dough together with your fingers. Place the folar onto lightly floured sheet pans or into smaller molded bread pans for small loaves. Preheat oven to 400 degrees. 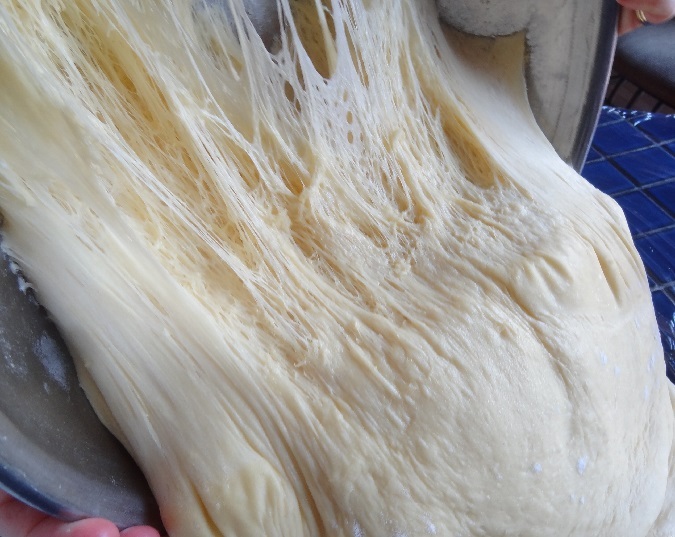 Let the formed folar rest for 10 minutes for a second rise before baking. Cook for about 45 minutes at 400 then lower heat to 350. Cook another 15 minutes and turn off heat. 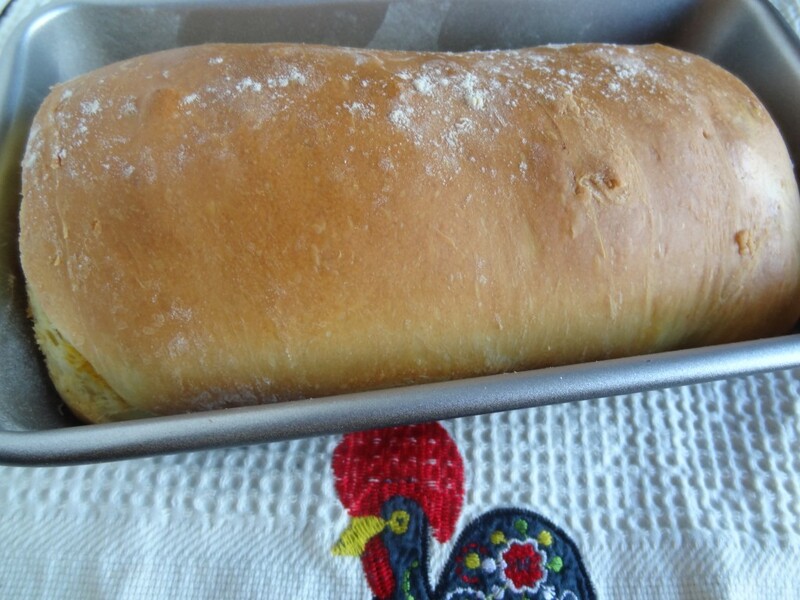 For small loaves cook for 30 minutes and lower heat to 350 for the last 15 minutes. Some ovens may take longer. Check if done, by hitting the top of the folar with your knuckles. You should hear a hollow sound and it should be a dark golden color. The smell of the folar baking in your oven will be simply amazing! I wish you could smell it right now as I pull it out of the oven! Just made FOLAR! 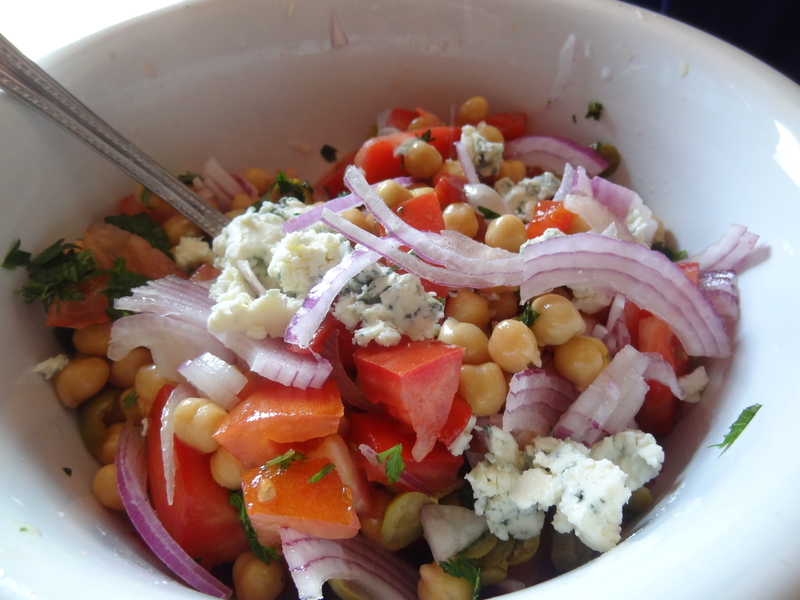 This recipe is easy to follow and the outcome was YUMMMMMMMMMMM! Thanks for sharing. 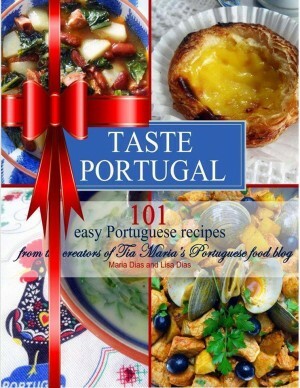 Keep up the tradition in honor of your mother, your family and THE PORTUGUESE. Happy Easter everyone. Blessings and joy to all.